Whenever a major earthquake strikes or a hurricane unleashes its fury, the devastating results fill our television screens and newspapers. Mary C. Comerio is interested in what happens in the weeks and months after such disasters, particularly in the recovery of damaged housing. 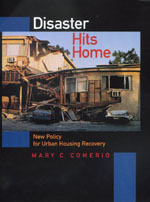 Through case studies of six recent urban disasters—Hurricane Hugo in South Carolina, Hurricane Andrew in Florida, the Loma Prieta and Northridge earthquakes in California, as well as earthquakes in Mexico City and Kobe, Japan—Comerio demonstrates that several fundamental factors have changed in contemporary urban disasters. The foremost change is in scale, and as more Americans move to the two coasts, future losses will continue to be formidable because of increased development in these high-hazard areas. Moreover, the visibility of disasters in the news media will assure that response efforts remain highly politicized. And finally, the federal government is now expected to be on the scene with personnel, programs, and financial assistance even as private insurance companies are withdrawing disaster coverage from homeowners in earthquake- and hurricane-prone regions. Demonstrating ways that existing recovery systems are inadequate, Comerio proposes a rethinking of what recovery means, a comprehensive revision of the government's role, and more equitable programs for construction financing. She offers new criteria for a housing recovery policy as well as real financial incentives for preparedness, for limiting damage before disasters occur, and for providing a climate where private insurance can work. Her careful analysis makes this book important reading for policymakers, property owners, and anyone involved in disaster mitigation. Mary C. Comerio is Professor and Vice-Chair in the Department of Architecture at the University of California, Berkeley. She is an internationally recognized expert on postdisaster reconstruction issues.